The following is my eyewitness account of events between Tuesday, January 25 and Saturday, January 29. I took all pictures and video footage below. This account only represents that which I have witnessed/filmed personally. It shows only one angle of the events of that week. An account of subsequent days will follow. 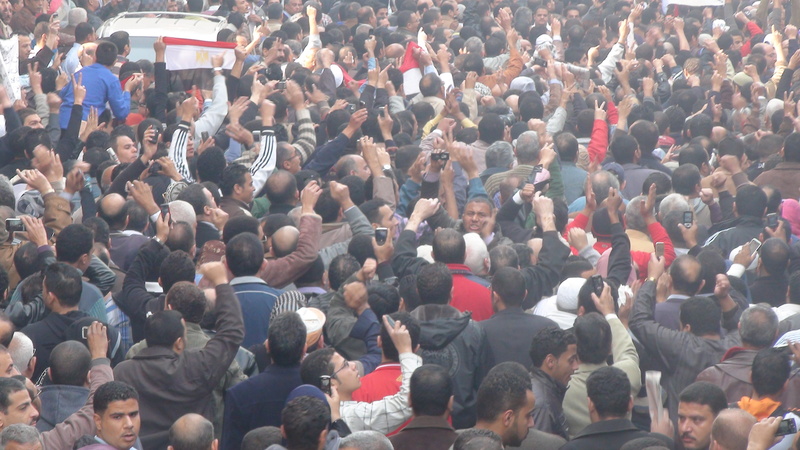 Day 1: On January 25, thousands of Egyptians in Cairo answered a call to protest against Mubarak’s regime. It was Police Day; a national holiday. 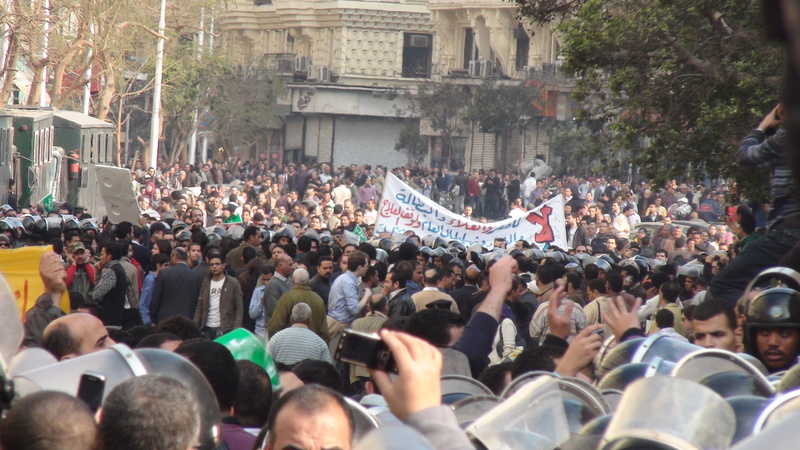 Marches started in various parts of Cairo around noon and eventually started to merge in the early afternoon. 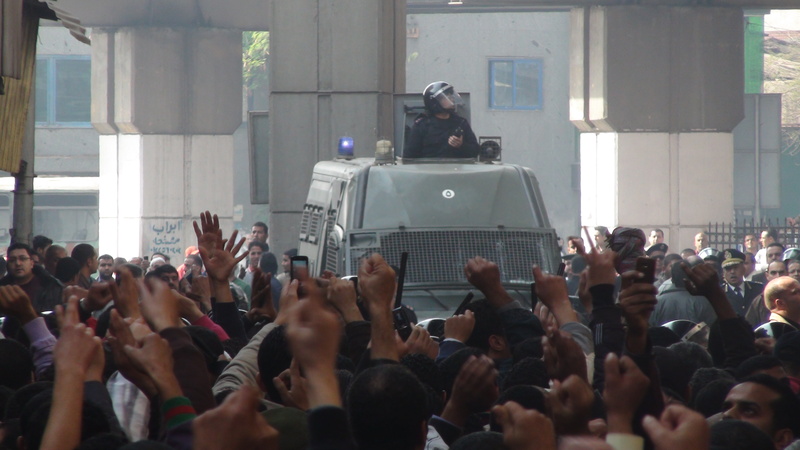 Marches continued throughout the afternoon in the downtown area of Cairo with some hindrances by the police in the form of barricades to separate protesters. 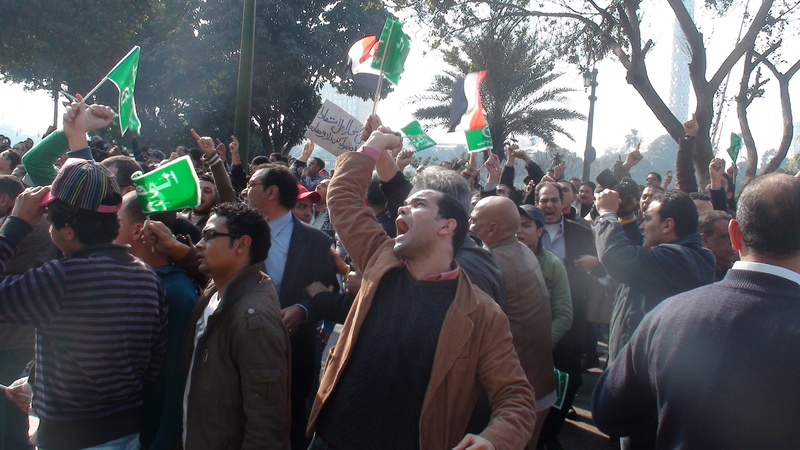 Protesters continued, nevertheless, to march throughout the downtown area until most of the groups eventually reached Tahrir Square. 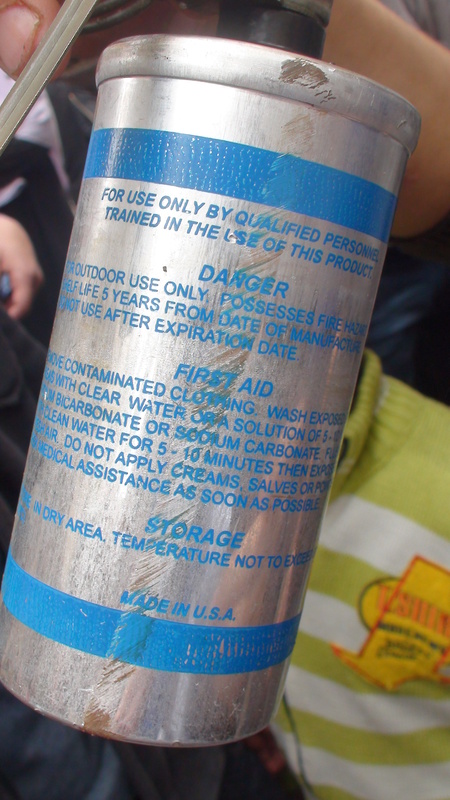 At 4:50pm, police fire the first tear gas canisters into the crowds to disperse protesters. Tear gas is then fired several more times. Angry protesters start forcing the police back. Rocks are thrown at police. Police rush the protesters, use more tear gas, and use water hoses. The upper hand goes back and forth between protesters and police, each pushed back for awhile and then the process is reversed. 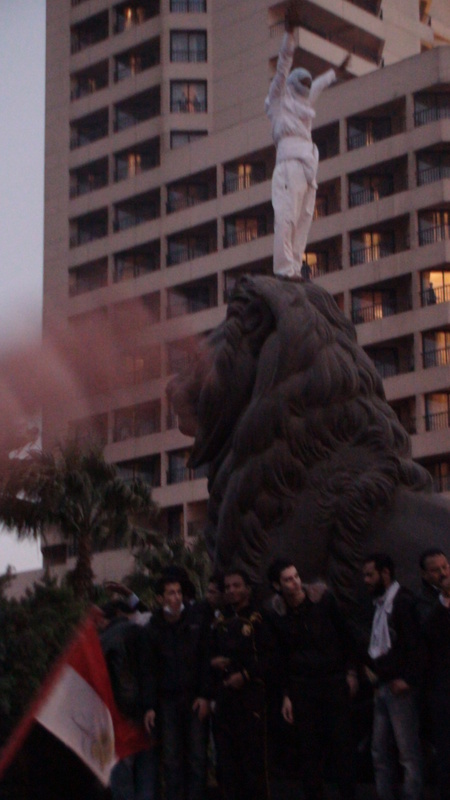 I leave protesters that night in the square in a relatively less violent atmosphere, singing the national anthem. Protesters eventually disperse and all go home. 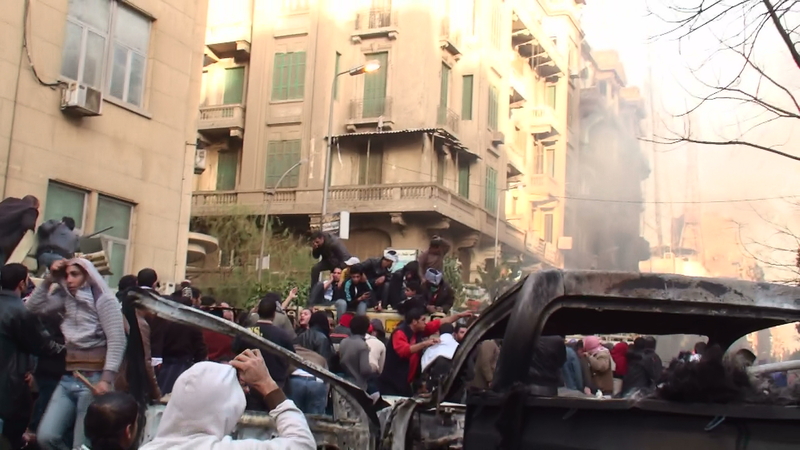 Days 2 and 3: January 26 and 27 witnessed some minor demonstrations in downtown Cairo as a continuation of demonstrations from the previous day. I did not participate in these demonstrations so I have no footage and cannot give an eyewitness account of events. 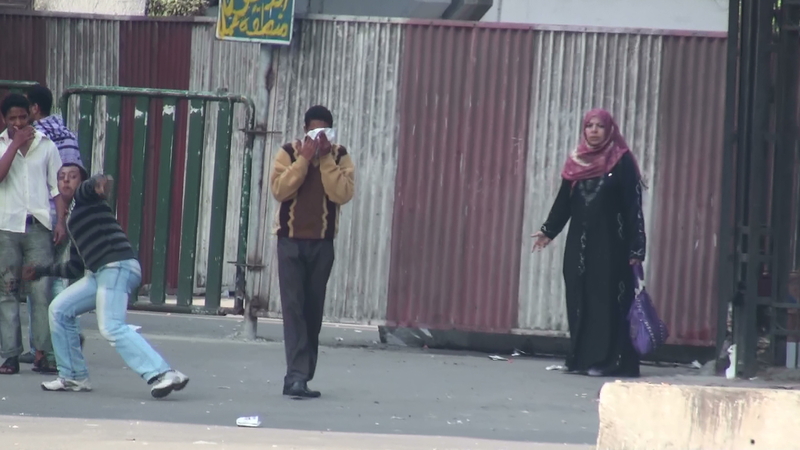 Egyptians, angry at the police brutality used against protesters on January 25, called for a Day of Rage after the Friday noon prayers on January 28. Several mosques all over the city were named as mosques where demonstrations would begin. I went to Al-Azhar Mosque. 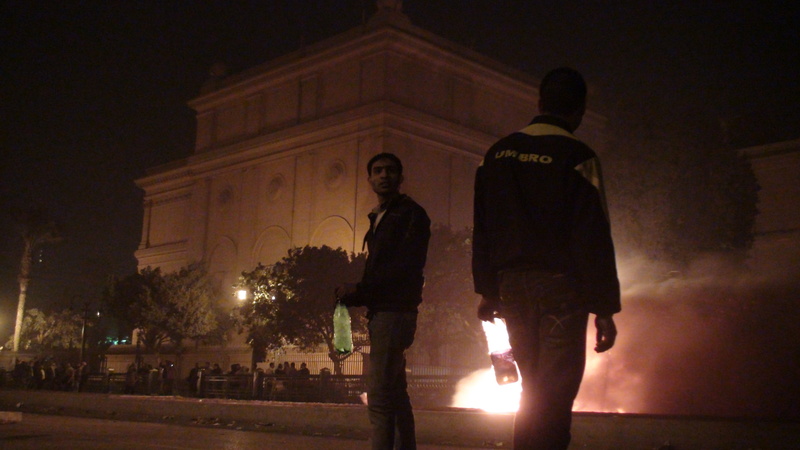 No one had expected the extent of the January 25 protests; neither protesters nor police. 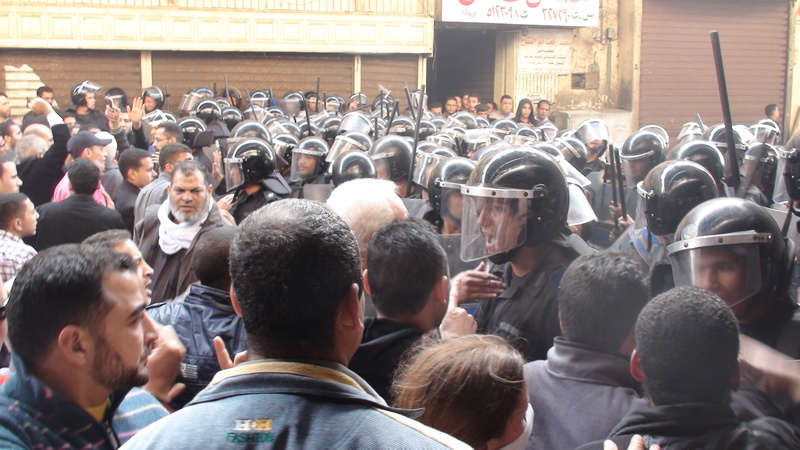 This time, the police were ready for the protesters and were determined not to let them reach Tahrir Square. Police barricades were set up all over the city to keep the protesting groups dispersed and to prevent any protesters from reaching Tahrir. 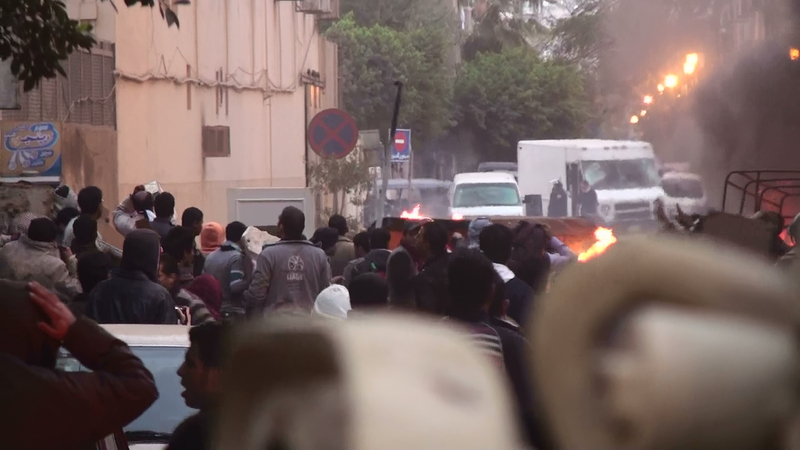 The Azhar march was met by police at Ataba Square by a large police force that almost immediately started using tear gas and rubber bullets against protesters to prevent them from progressing forward. My friend Arwa and I were caught up in this for awhile and eventually slipped through the police barricade to meet up with another group of protesters. 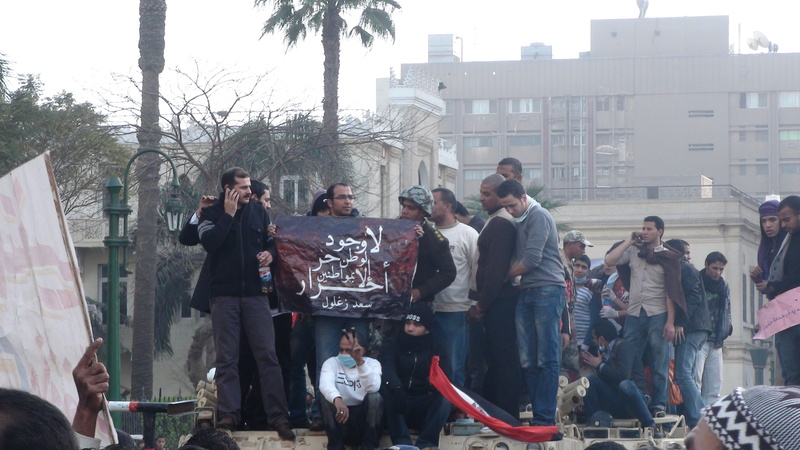 We marched with this second group for awhile and then decided to see what was happening in Tahrir. It was completely empty except for a very large police presence. 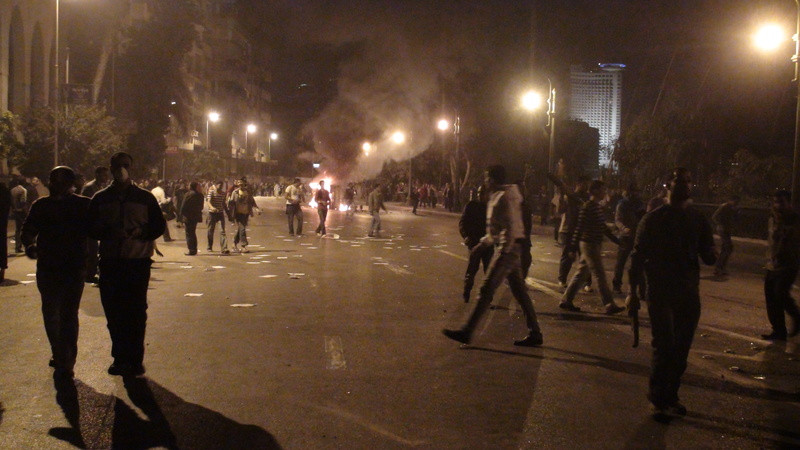 We passed through Tahrir, claiming to police that we were trying to make our way home. 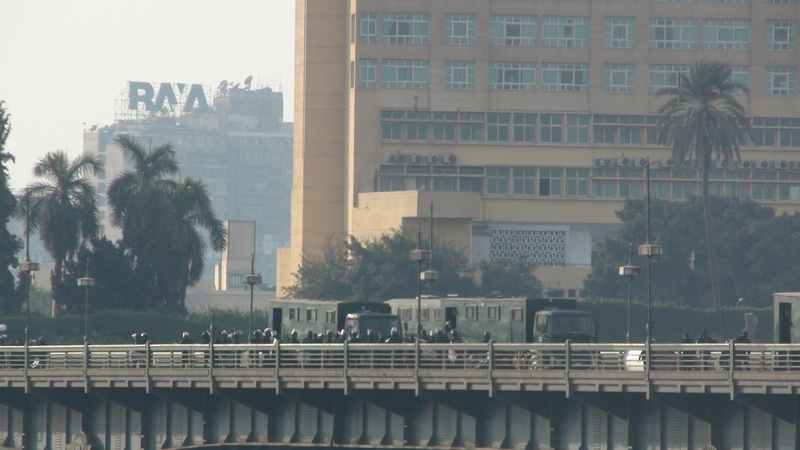 Once on the Corniche, we saw a very large police force occupying Qasr El-Nil Bridge, preventing protesters from crossing the Nile to reach Tahrir. 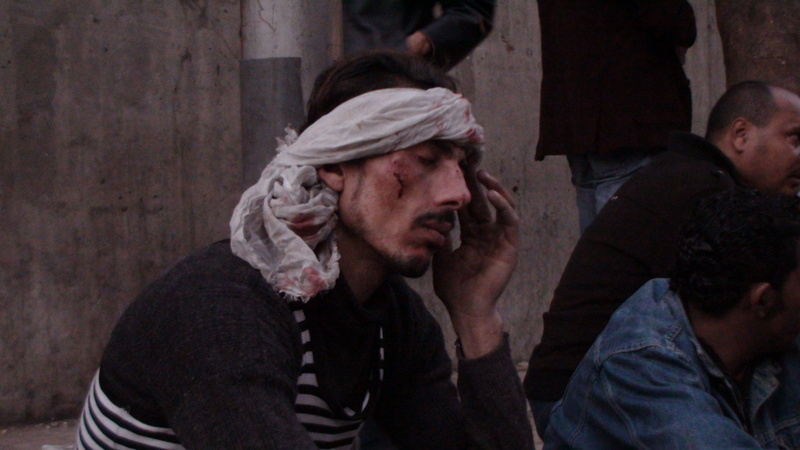 For two successive hours we heard gun shots and saw billowing clouds of tear gas. We could not see what was happening on the other side. We decided to make a long detour on foot to reach the other side. On our way, we stopped by Cairo University Hospital where we saw a man critically injured with bullet wounds in his chest. The doctor who brought him to the hospital told us that two other people had been taken to the hospital dead. We rushed out of the hospital and joined a large marching protest heading in our same direction. 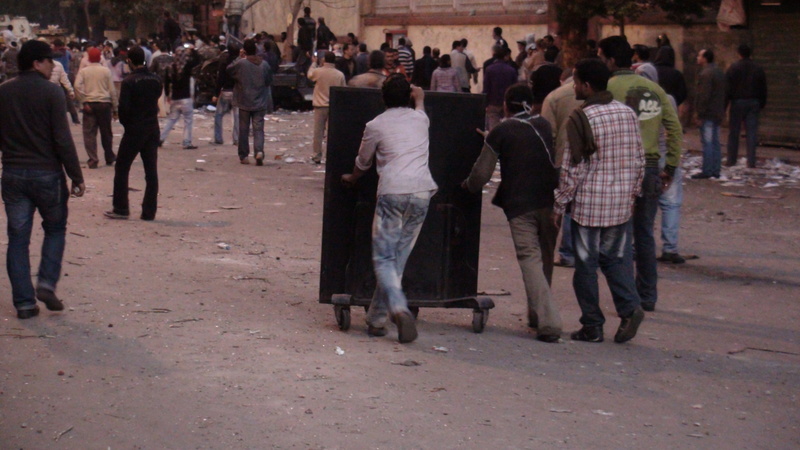 By the time we reached Qasr El-Nil, protesters had made some major ground and had overtaken two police trucks. 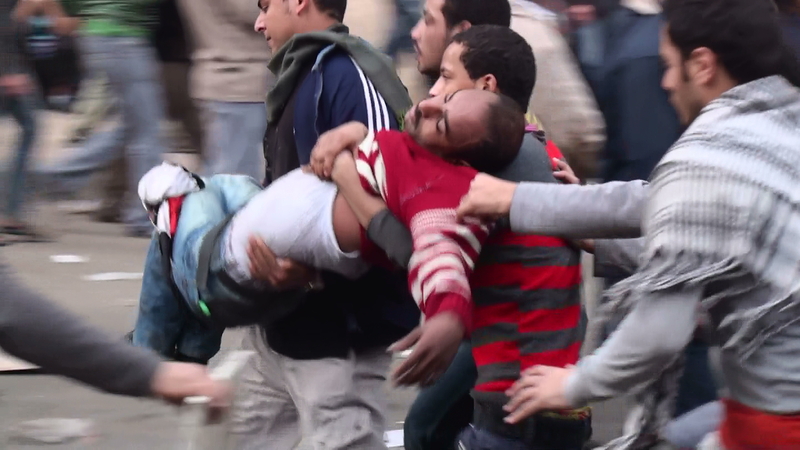 Several protesters died in the process, however, and many were injured. 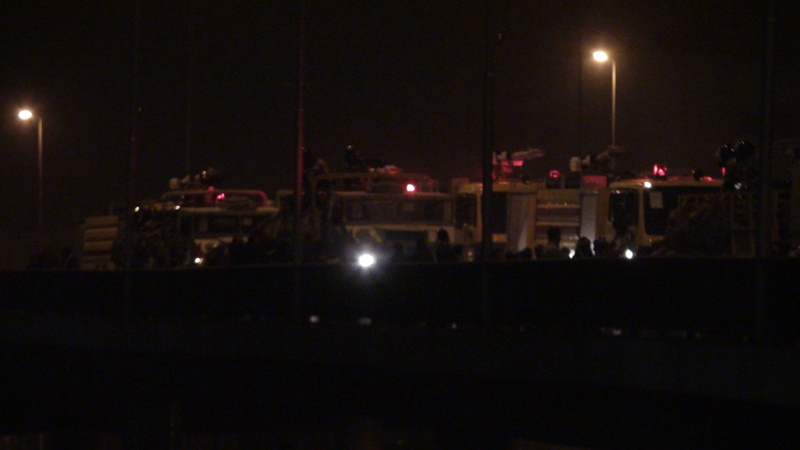 We joined the group as they attempted to cross Qasr El-Nil Bridge into Tahrir. We were heavily tear gassed. Eventually, Arwa and I broke away from this group, needing fresh air, and went behind Semiramis Intercontinental Hotel where intense fighting was going on between protesters and police near the Ministry of Interior. 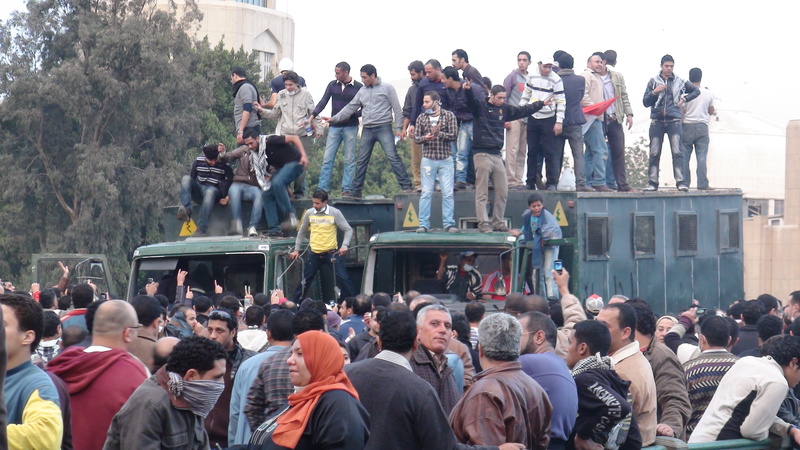 In the meantime, protesters managed to break through to Tahrir Square and occupy it. 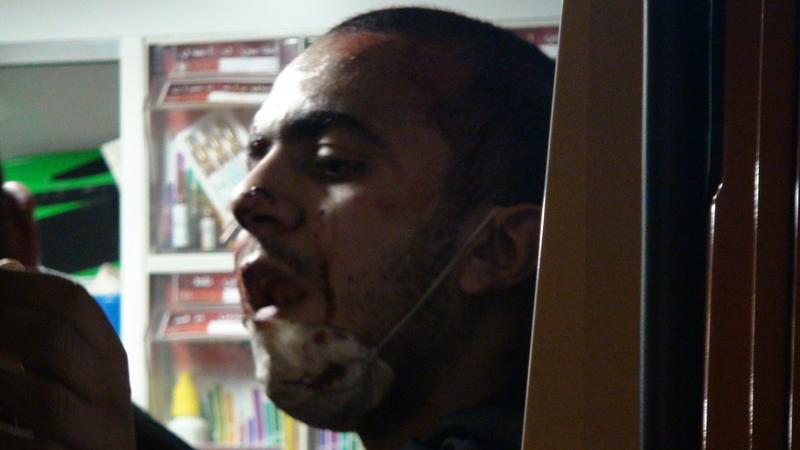 Arwa and I spent most of that night filming the fighting at the Ministry of Interior. 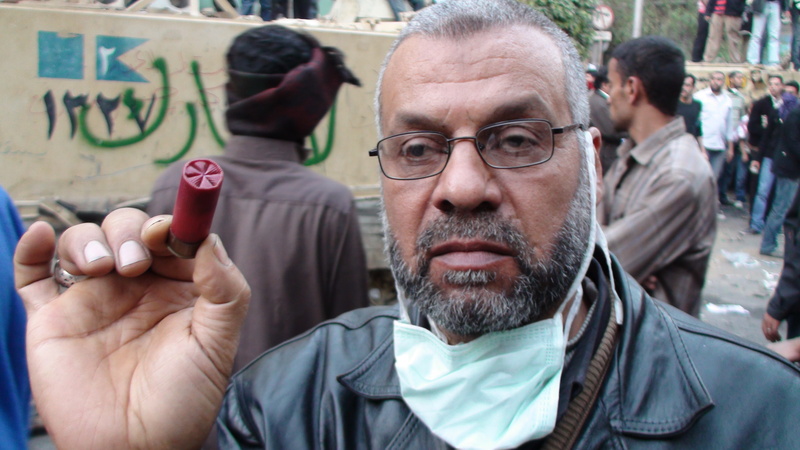 Protesters – with us in their midst – were tear gassed and shot at continuously. 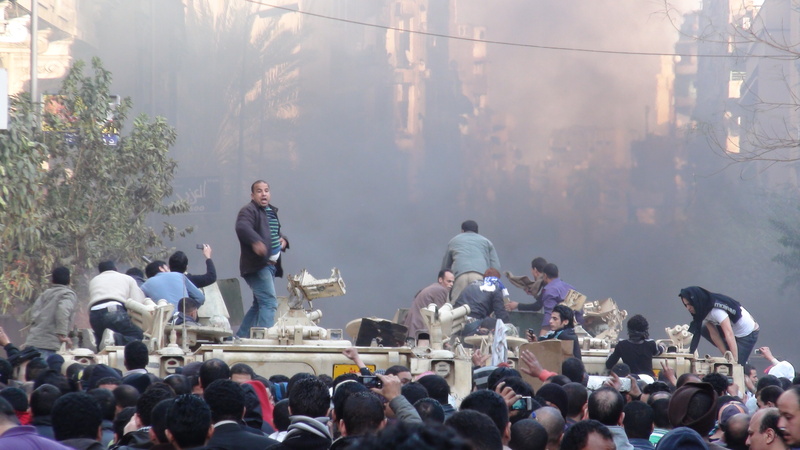 When we eventually slipped away from the area of fighting, we found Tahrir Square completely occupied by protesters, the National Democratic Party building up in a blaze, and several army tanks trying to enter the downtown area. 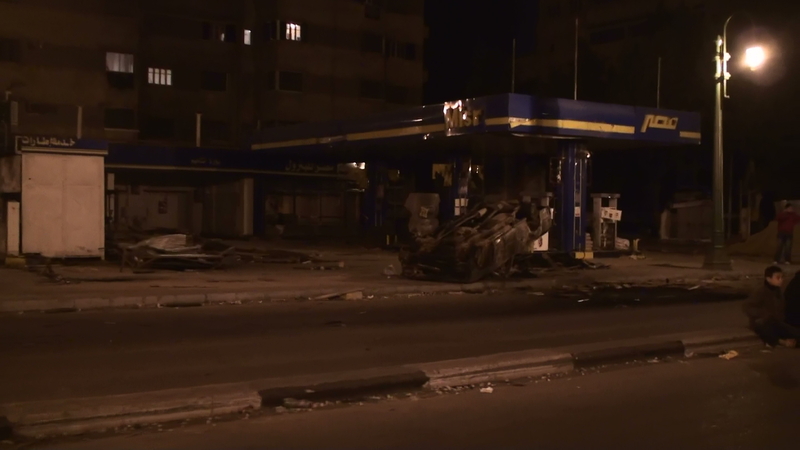 With the exception of the Ministry of Interior area, no police presence was to be seen. 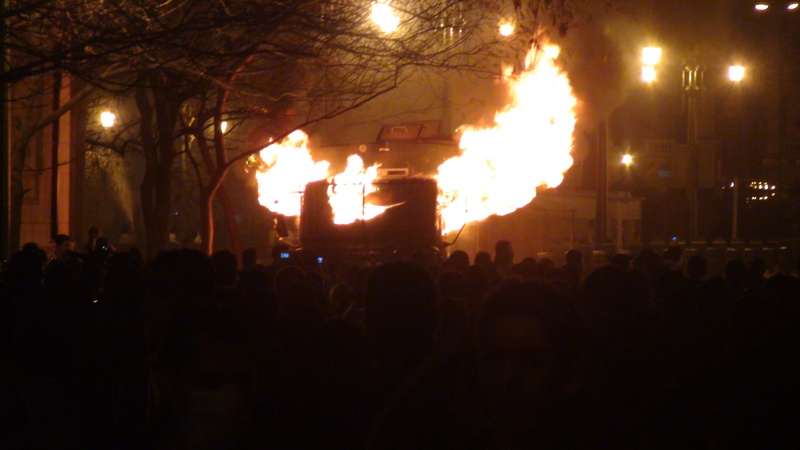 Police trucks and cars were in flames on the outskirts of Tahrir Square and the NDP building was being looted. Arwa and I walked home, dark having cloaked the city completely, feeling quite safe. 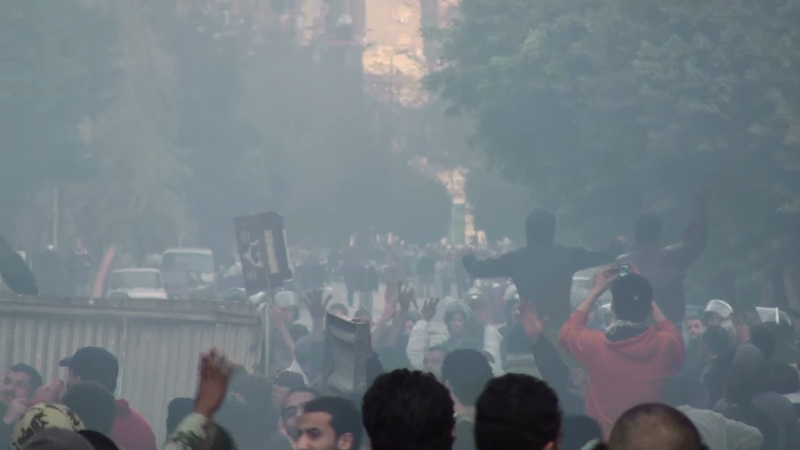 We were to find out later that many parts of Cairo witnessed similar events, police stations were attacked, the complete police force had disappeared overnight, and jails were witnessing breakouts. Looting and torching of some businesses began. After witnessing the unfolding of events of Friday, January 28, I mistakenly thought the worst was over and it would be only hours before we hear about the resignation of President Hosni Mubarak. I was wrong. 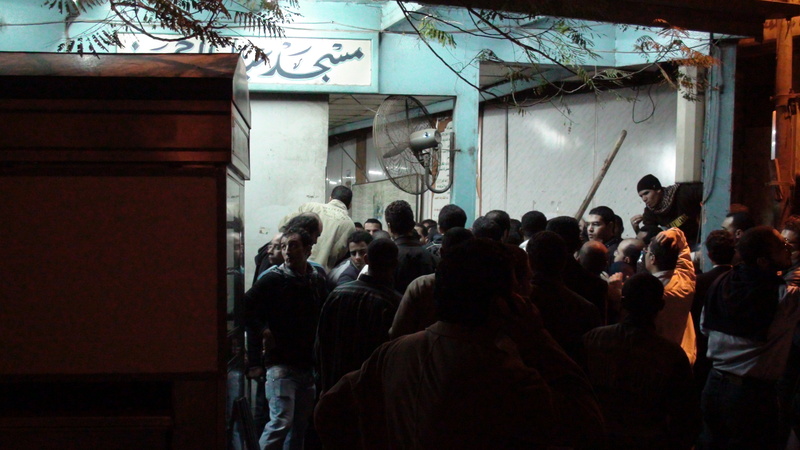 I woke up in my dad’s house – closer to Tahrir than my own – and decided to return to my home in Pyramids Street. The police were absolutely nowhere to be seen. The army had a strong presence in some areas and a small one in others. Pyramids Street was one of the areas where there was a strong military presence. Looting and burning of businesses had gone on throughout the night. 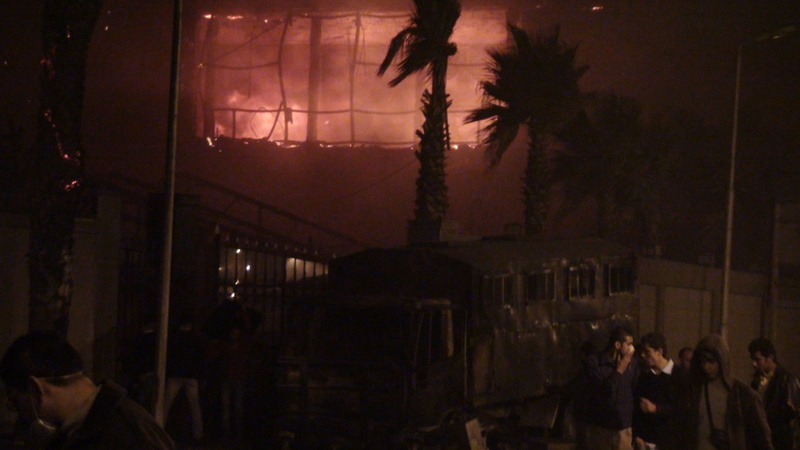 I saw three night clubs had been burnt and looted in addition to several coffee shops and a well-known pastry shop. 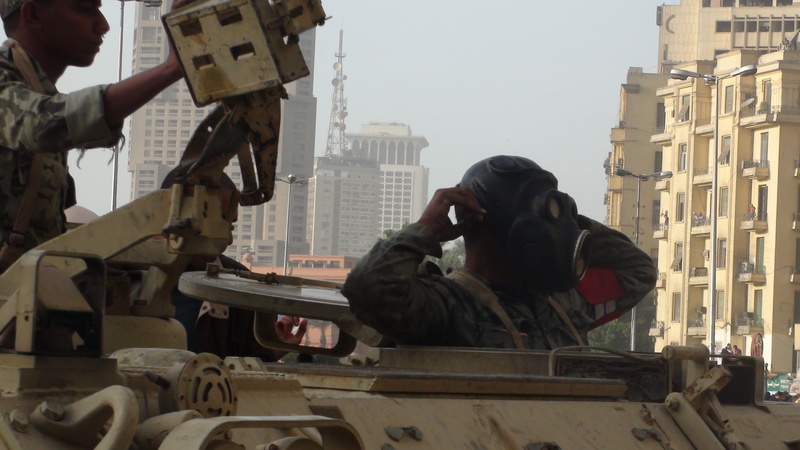 Army tanks lined the street at a distance of about 200 meters from each other. I still did not think much of all this. Today I would go to the supermarket because I had plans to go on holiday and I wanted to make sure the house had food when I got back. I was still moving to plan. 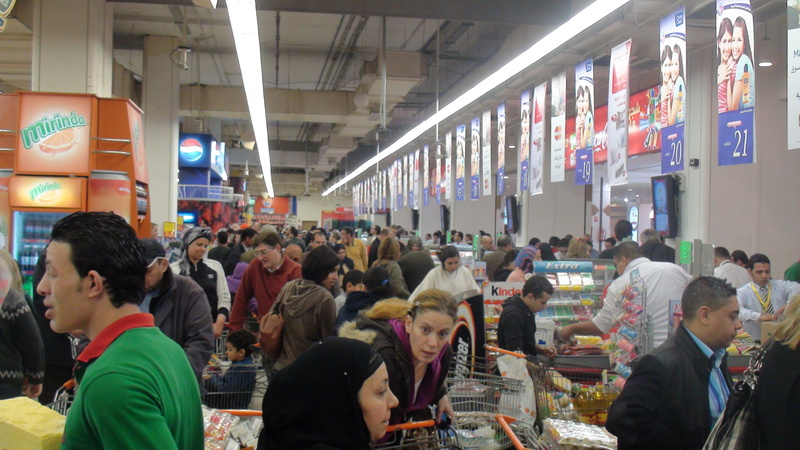 The supermarket was jam-packed with shoppers who had heard about the events of the night before and were concerned about what was to come. 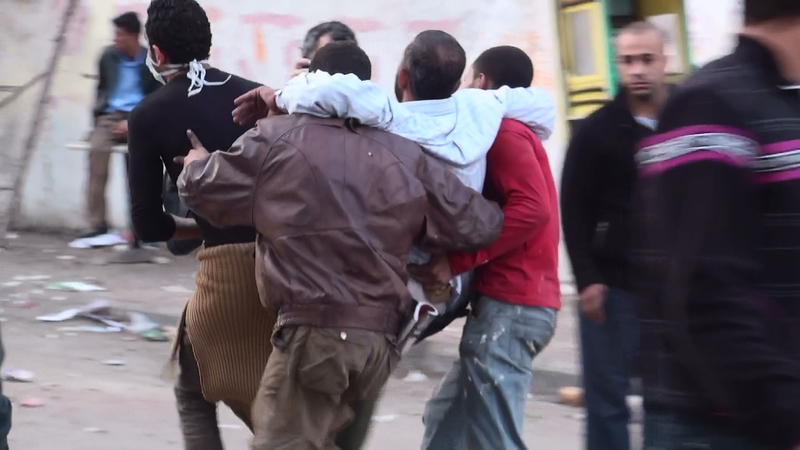 News started coming out of many jail breaks and thugs appearing on the streets of Cairo. People spontaneously started organizing neighborhood watches. 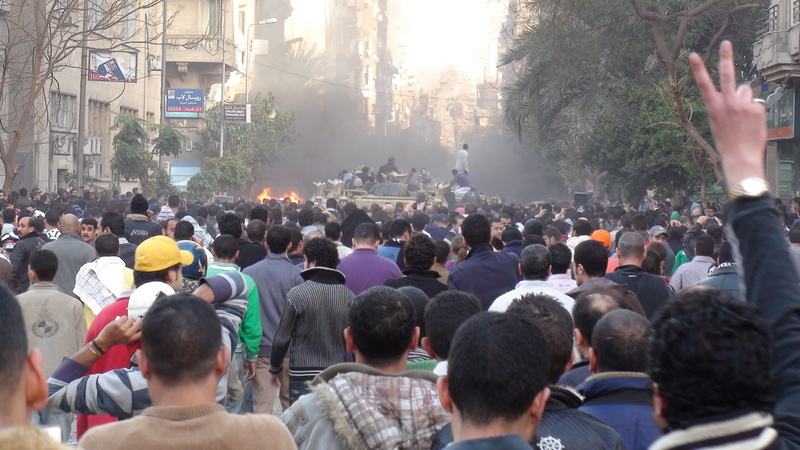 I did my shopping, stocked the house, and headed down to Tahrir. I had expected to see a celebratory mood in the Square and for it to be a quiet day. The mood was indeed celebratory at times but also mourning at others as martyrs from the previous day were marched through the square. 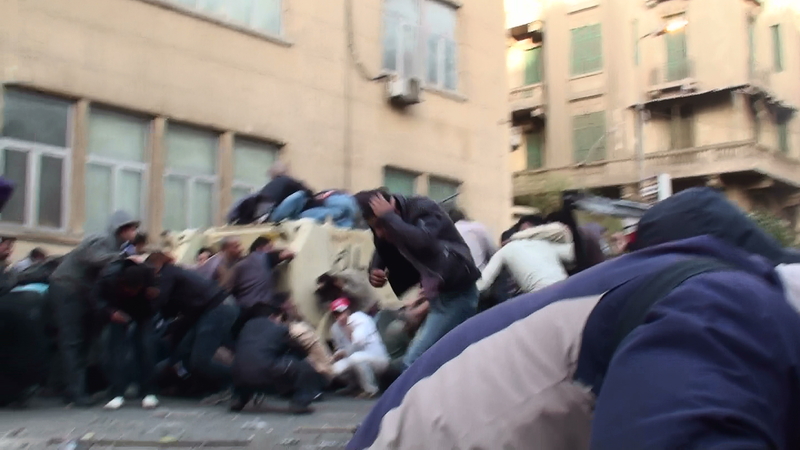 Fighting emerged in one corner of the Square where the final police stronghold remained defending the Ministry of Interior. 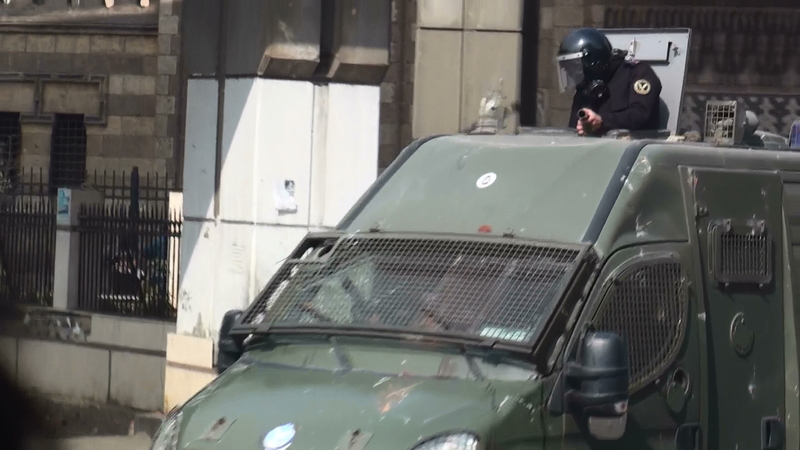 Protesters, angry at the deaths of their comrades the previous day, were determined to completely remove the police presence from the Square and its surroundings. Some said that the Minister of Interior himself was inside the Ministry building and that protesters wanted to get at him. 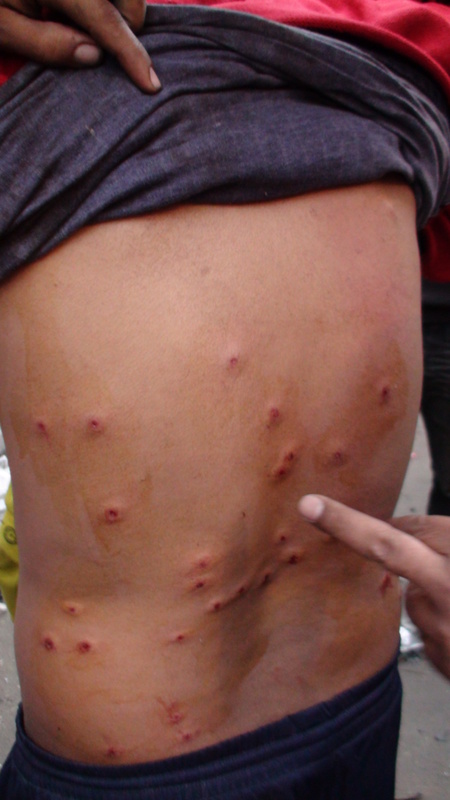 Fighting went on for hours, injured and unconscious/dead emerged as police used rubber and pellet bullets to shoot at protesters. 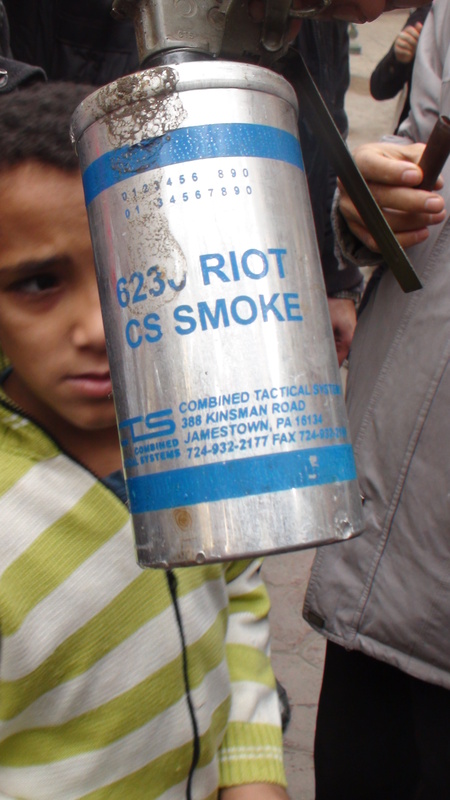 Intense amounts of tear gas were used as well. Protesters used rocks. As night started to fall over Cairo, I visited a mosque-turned-field-hospital just at the rear of where the fighting was happening. Several injured were being treated. I then received two calls, one from my sister and another from my friend, urging me to quickly get home because there was a curfew and there were reports of thugs out on the streets. 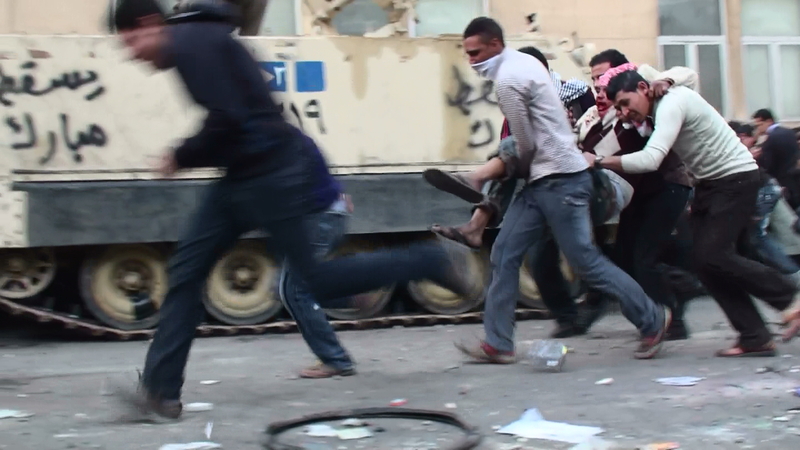 Terrified, I had three of my male friends walk me to my father’s house, about 25 minutes walking distance from Tahrir. Neighborhood watches had started working. Many men were on the streets, wielding wooden or metal rods. There was no way to tell who was friend and who was foe. We rushed home, walking in the middle of the empty streets all the while so we could not be ambushed without anyone noticing. A band of youngsters appeared from afar. 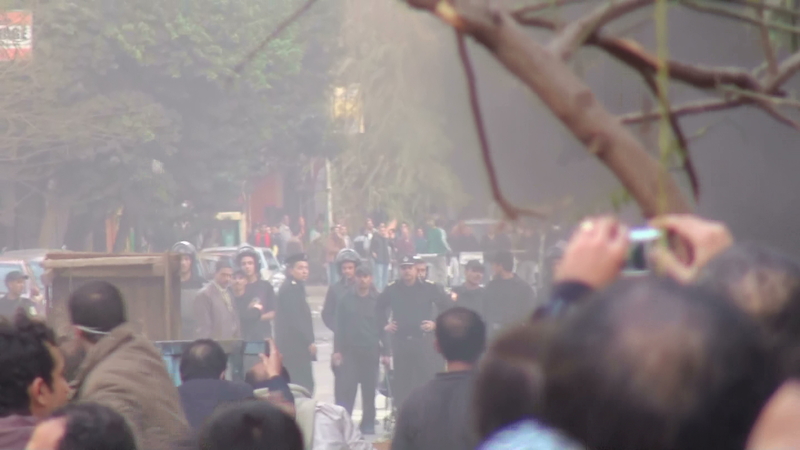 There was no way to tell whether they were protesters marching to Tahrir, thugs out to loot, or a group of young men scanning the neighborhoods to join in on any action. 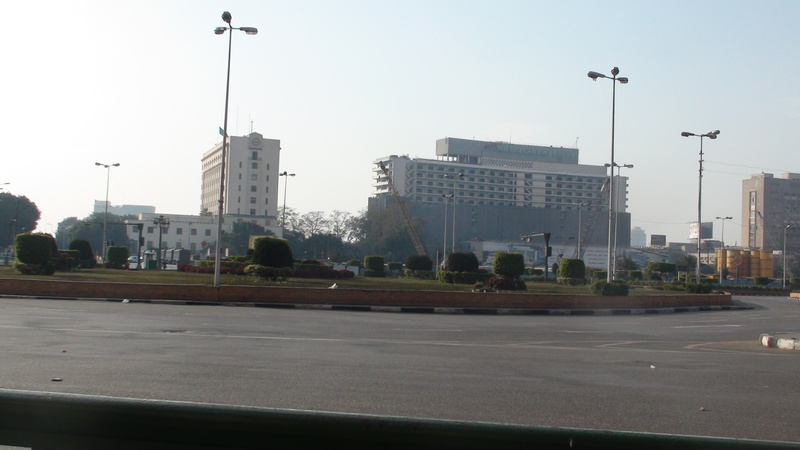 The men protecting Cairo University Hospital urged my group to rush into the hospital to be safe. I urged my group to continue forward. My father’s home was near. We just needed to walk quickly. We made it home. The doorman was camped right in front of the locked door and showed us a small sword he had just bought for protection. I invited one of the young men who accompanied me home, a good friend of the family, to stay overnight. Mohammed had no way of getting home safely that night. My father, my sister, myself and Mohammed spent the night in front of the television set, our eyes glued to the news. Mohammed urged us to look for anything we could use for protection in case the apartment was broken into at night. We took out my father’s canes. Throughout the night, we could hear gun shots and voices of men rallying each other. We had no way to tell what it was all about. Morning finally came. Mohammed headed off to his house and I headed off to my own. 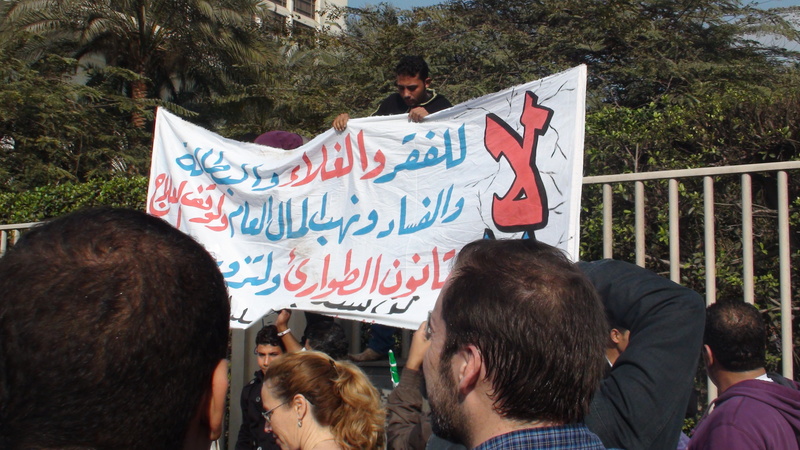 Sign says: "No free country without free people"
I am an American living in the US, I lived in Cairo for 6 years, teaching English at Choueifat. I am very good friends with a family in the Pyramids area of Cairo. I’m worried about them. Can anyone tell me how I can reach them? الرجال يظهر معدنهم الحقيقى وقت الشده , و يظهر هذا المعدن واضح جليا فى المواقف الصعبه , و طبعا فى الثوره الأخيره بتاعه 25 يناير ظهر معادن الناس على حقيقتهم سواء من فنانين أو لأعبين كره قدم أو مذيعين أو أنا حبيت أكتب شرفاء مصر الذى ظهر معدنهم الحقيقى فى ثوره 25 يناير و وقفوا إلى جانب الحق و لم يهابوا أحد على الأطلاق لأنهم يعلمون أنهم على حق …..
1-منى الشاذلى : كان موقفها واضح من أول ثوره 25 يناير و قدمت حلقتين رائعه مع عمار الشريعى و وائل غنيم . 2-محمود سعد : أعلامى محترم رفض الظهور فى الأعلام حتى لا يصبح منافق مثل رجال أنس الفقى المنتشرين فى قنوات كتيره و كان مصيره أجازه مفتوحه من العمل لأنه وقف إلى جانب الثوره . 4-المخرج خالد يوسف و المخرج عمرو سلامه و المخرج يسرى نصرالله و المخرجه كامله أبو ذكرى و المخرج هانى خليفه و المخرج على بدرخان . 5-عمرو واكد : الذى أعلن من أول يوم تأييده للثوره و رفضه للنظام و خروجه فى المظاهرات و قام بتوزيع زجاجات مياه على المتظاهرين و تم اعتقال اخوه . 6-رأفت المهينى و داوود عبد السلام و خالد الصاوىومحمد العسيلى و عبد العزيز مخيون و أحمد سعد و أحمد عيد و خالد أبو النجا و أسر ياسين و خالد النبوى و أحمد راتب و ذكى فطين عبد الوهاب و داؤود عبد السلام ( معظم هذه الأسماء تم الحصول عليها من مواقع مختلفه) . 8-الاعلامى المحترم ( علاء صادق ) : قد تختلف معه فى كثير من الأحيان ولكنه رجل ذو مبدء . 9-الاعلامى (وائل الأبراشى) : الذى يهاجم بأستمرار الفساد و الفاسدين . 10-الأعلامى ( عمرو الليثى ) : المحترم الذى يقدم برنامج واحد من الناس و يشعر بهموم الناس و ألامهم . 11-الداعيه ( عمرو خالد ) و الشيخ ( محمد حسان ) و كلاهما أيد الثوره السلميه بعيد عن التخريب و كلاهما خرجا فى المظاهرات . 12-الشيخ ( يوسف القرضاوى ) : الذى أيد الثوره بكل قوه من خلال خطاباته الحماسيه . 13- رئيس تحرير جريده الدستور سابقا ( إبراهيم عيسى ) . 14-جميع أنواع المعارضه بأطيافها منها رئيس حزب الوفد ( السيد البدوى ) و ( إيمن نور و جميله إسماعيل ) و الأخوان المسلمون و شباب 6 إبريل و حركه كفايه و( حمدين صباحى ) و ( رجب حميده ) و ( محمد حسنين هيكل ) -الموسيقار ( 15 عمار الشريعى ) : حيث أيد الثوره من خلال ظهوره فى برنامج العاشره مساء و فى اليوم التالى نزل إلى المظاهرات , حيث تحسب لعمار الشريعى الكفيف الذى نزل إلى المظاهرات و ألتحم مع الشعب و للأسف لم ينزل الكثير من الفنانين إلى ميدان التحرير كما فعل عمار الشريعى . I wanted to let you know that I used your blog in assemblies in our school this week. The aim was for the pupils to understand what it’s like to be at the centre of a major news story and turmoil in a country. What you wrote and the videos were used in assembly and classes and the pupils really listened carefully. Thanks so much, Paul! I am so glad the Internet has allowed us to cross borders and reach out to each other in ways that were not previously possible. We live at a great time. Please keep in touch!